By Maram Aoudi - May 2011. 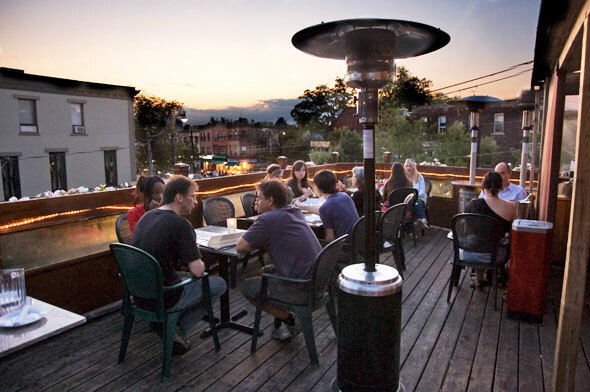 Finding the best rooftop patio in Toronto is a bit of challenge. It’s not because our city has no class; in fact, she has a lot to offer in terms of entertainment. It just depends on the style and atmosphere your mood is gravitating towards. If you are looking for an oasis in the sky that’s calm, relaxing, yet social, then this is for you. The seven-rooftop patios mentioned all fit the characteristics of a majestic mirage. The décor is designed in a simplistic yet inviting way, the service is incredible and the drinks can quench a thirsty camel. Ultra is known as the place with the big red doors. Sure, it’s no Notting Hill fairy tale, and we are not expecting Hugh Grant to make an appearance any time soon. But the doors and exquisite look of the club are very enticing and mysterious. 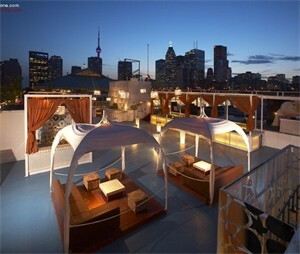 Located at Queen and Soho, the rooftop patio puts the city on a platter, highlighting the beauty that is Toronto. You can enjoy a special seating section or lounge on the couches with friends. Make sure to arrive early for a comfortable transition from dinner to nightlife. Thompson Hotel suggests grace and elegance. 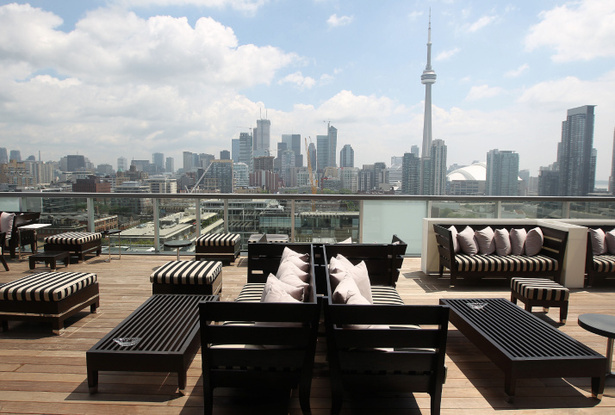 The rooftop patio—also known for its incredible view of the city—is located on Wellington Street. The radiance of the city is projected in a 360-degree view of the skyline and Lake Ontario. You get to float over the land and water while you sip on sweet and decadent beverages made by the hotel’s talented team. Enjoying the drinks a little too much? You can always stay at one of the hotel’s luxurious rooms and wake up to the same view you glimpsed at the night before. The Drake Sky Yard has the best mojitos in town. Sure, they are a bit on the pricey side, but they are massive. This has nothing to do directly with their incredible rooftop patio, but the thought of enjoying one of those bad boys at a glamorous and inviting location makes them that much better. Not only is this place ahead of the game when it comes to social media and press, but they are unique. The drake sky yard is one of the only places left in Toronto where smokers can enjoy a puff outside. 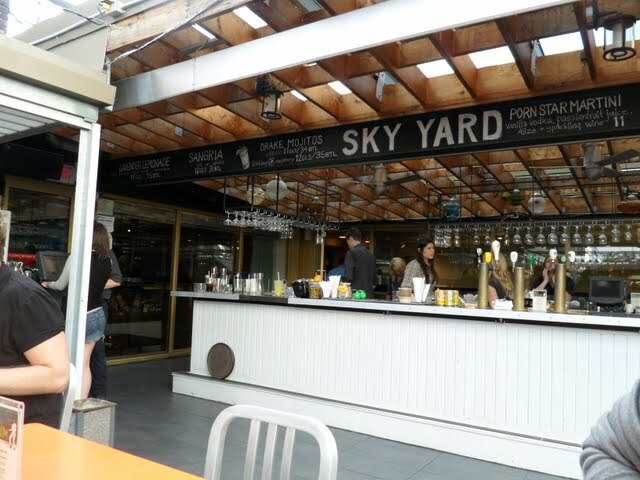 The sky yard is a square space area that is open all year around. Terrible SEO can lave your website hurting on the search engine rankings. Don't leave your internet marketing to bad SEO Miami, trust a company that has a proven track record of long-term success. Elite Rank Media is the one and only Miami SEO that can and will deliver results. Regardless if you want to make your website more profitable or improve your Reputation Management efforts, Elite Rank Media knows what it takes to bring your brand and business Elite! This next location has managed to make a name for itself in a short amount of time. The roof top patio at Skybar is only open on weekends in summertime, but they do such an incredible job during those short months and manage to keep people on the lookout for their blissful events. Enjoying the city in decadent white tents must feel like an incredible carpet ride. The first time I made it to this patio I was stunned by the location and venue. 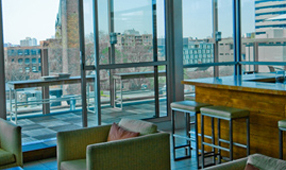 Great space, large and accessible bar, friendly staff and a great view of the city—what else can you ask for? Sure, they must have had to do a lot of flat roof repairs, but that was necessary in order for them to provide Toronto with the greatest view of College St. Our next great rooftop patio goes to Vivoli. College St., a haven for foodies, is known to be one of the most culturally extravagant spots in Toronto. Italian, Japanese and Mexican restaurants are separated by antiques stores, comic book sanctuaries and flower shops—this street has it all. Vivoli’s wonderful rooftop patio sits right in the heart of it, giving those looking to unwind and people watch the best seat in town. I give this location a great thumbs up for their appetizing food, delicious drinks and a dreamy view of one of Toronto’s best hubs. 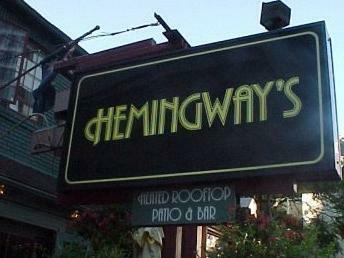 Known for their delicious sweet potatoes fries, Hemingway’s is one of those places everyone has been to. It’s fun for people just finishing work and those who want a break from shopping. The only downfall of this location is the fact that it’s always busy. I know, seems silly to complain about the success of an incredible venue. This one is perfect for all the lovers of networking and socializing. Even though it is busy, they still manage to provide great and attentive service. To me, Hemingway’s echoes with sounds of excitement and adventure. Last but most definitely not least is The Spoke Club. This exclusive location is known for their glass and garden rooftop patios. The glass house made of steel puts a futuristic yet classy spin on rooftop patios. The beautiful layout and décor of the place will have you falling in love and never wanting to leave. Enjoy easy access to the bar that won’t have you stumbling over others to reach it. The garden section of this patio is another exquisite site. Find a friend with a membership and bribe them with something they desire for a chance to experience this place. In my opinion, all these locations offer a unique and different taste on a classy, relaxing Toronto. Sometimes the city moves so fast it’s exhausting trying to catch up with it. Well, now you can take a moment and enjoy yourself at one of these fine locations (or all of them) to unwind and gear up for whatever comes next in your life.